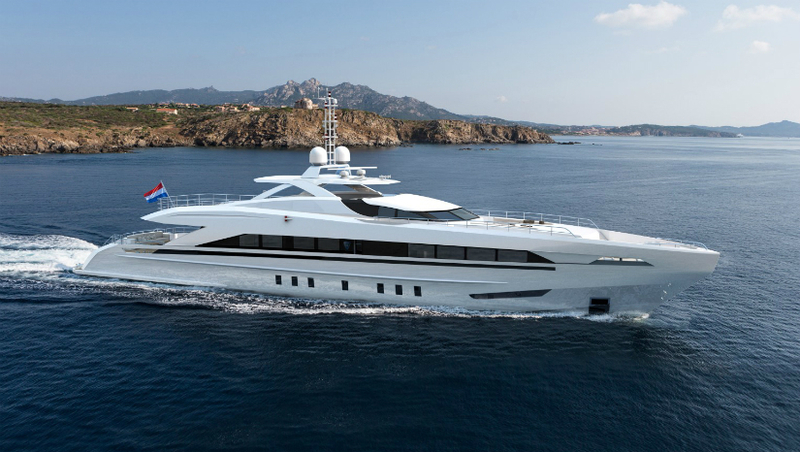 Heesen Yachts has launched YN 17145 – Project Necto. The 45 metre semi-displacement all aluminium motor yacht was christened Amore Mio by her owners in a private ceremony. Amore Mio is the largest and most powerful sports yacht ever built in the Netherlands. The long, angular vessel will reach a top speed of 30 knots, powered by 2 MTU 16V diesel engines. Her sleek, 45-metre aluminium hull, powered by two MTU 16V diesel engines, will slice through the sea at a thundering top speed of 30 knots. With long, angular lines soaring like a javelin from her knuckle bow through to the transom, she is yet another high calibre, successful design by Omega Architects. She has both advanced gyro stabilisers and active interceptors working to give the best possible sea keeping conditions at 30 knots or zero speed. A particularly unique feature on Amore Mio is her MOB Rapid Reaction System. If a passenger goes overboard, there are multiple buttons around the vessel that, when pressed, instantly open concealed hatches dropping high-visibility inflatable life rings in the water to both mark the position of the MOB and also serve as a flotation aid. Alarms will be sounded and the yacht’s location is instantly recorded in the vessel’s chart plotter program. Amore Mio will be intensively tested in the North Sea and delivered to her owners by the end of January 2016.